Dr. Múnera is an Assistant Professor of Radiology, Department of Radiology, University of Miami, Jackson Memorial Hospital, Ryder Trauma Center, Miami, FL. In the evaluation of vascular injuries, catheter angiography has been the gold standard imaging modality. 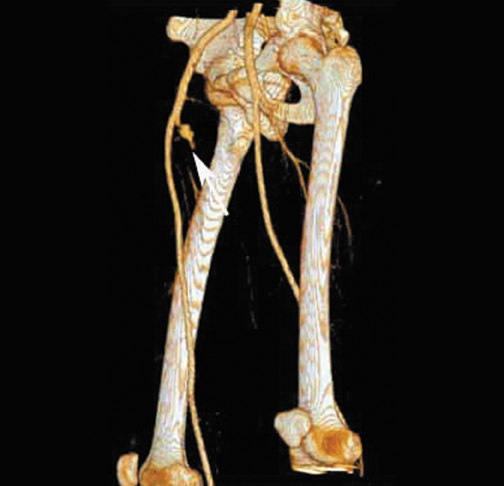 As computed tomography (CT) technology has evolved, helical multislice CT (MSCT) angiography has become an integral part of the initial assessment of many injured patients. The ability to obtain high-resolution images with MSCT during optimal contrast enhancement helps detect the presence and define the extent of vascular injuries. 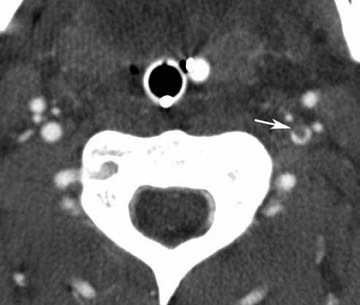 CT angiography (CTA) has increasingly been used to diagnose arterial injuries resulting from blunt and penetrating trauma of the neck and extremities. 1-7 At our institution, CTA has replaced angiography for diagnosis of most vascular injuries resulting from penetrating and blunt trauma to these regions. This article describes the author's current imaging protocol with MSCT, the spectrum of diagnostic findings seen in vascular trauma, and the role of CTA in the planning of vascular injury management. Scan parameters of our MSCT examinations are as follows: 120 to 140 Kvp; 250 mAs. Other technical parameters vary according to the specific anatomic area and depend upon the specific CT scanner used; at our institution, we currently use 4-channel detector scanners (Table 1). The injection protocol utilizes 100 to 120 mL of intravenous nonionic contrast material at a rate of 4.5-mL/sec by means of a power injector via an 18gauge catheter placed in an antecubital vein and an automated triggering device (bolus tracking). A fixed scan delay may be used at institutions where the automatic delay is not used or where it is not available (Table 1). An alternative method of establishing the scan delay is to use a test bolus. With the test bolus technique, a small contrast bolus is administered while scanning at a fixed level in the region of interest-for example, the aortic arch. From this test, a time-density curve is obtained. Axial images are reviewed at a workstation or picture archiving and communication system (PACS) station, and multi-planar reformations (MPR) or 3-dimensional (3D) renderings are obtained using volume rendering (VR) algorithms. 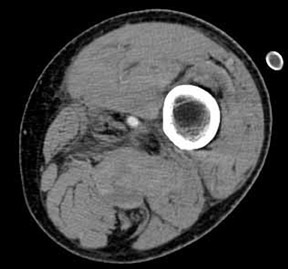 Scrolling through the images on the PACS workstation using the cine mode allows for easy detection of subtle changes in vessel caliber and small extraluminal collections of contrast. Multiplanar reformations and 3D reconstructions are often useful in the interpretation of challenging cases as well as in planning subsequent interventions because most surgeons prefer these reconstructions that closely resemble the more familiar digital subtraction angiogram images. 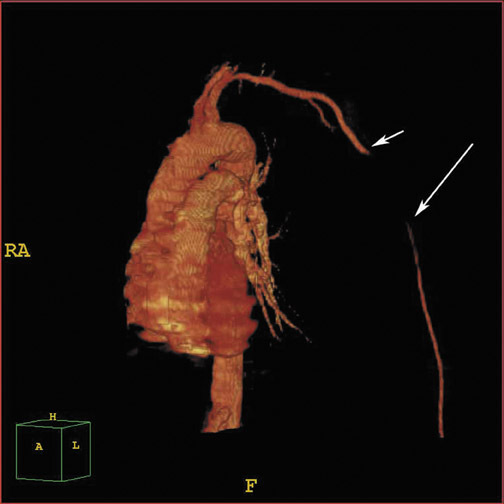 The 3D im-ages are also useful in the evaluation of arterial segments that course in the plane of the axial CT, such as the subclavian and axillary arteries (Figure 1). 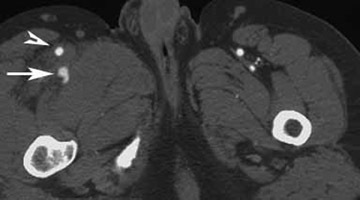 Direct signs of injury on CT angiography include irregular arterial margins and filling defects, contrast extravasation, lack of vascular enhancement, and vascular caliber changes. 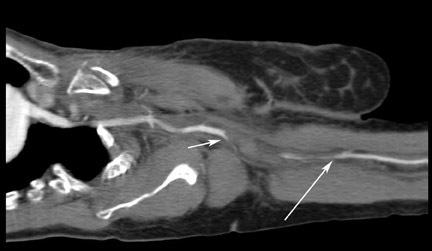 Indirect signs of vascular injury include indistinctness of the perivascular fat planes, perivascular hematoma, and bone and bullet fragments <5 mm from a major vessel. The presence of an indirect sign should be considered a potential indication for a conventional angiogram. The decision to perform a catheter angiogram on patients with indirect findings depends on the experience of the interpreter, the quality of the scan, and the clinical condition of the patient. In patients with an indirect finding around the carotid circulation, angiography is usually warranted because of the potential catastrophic consequence of missing an arterial injury on this location. The arterial lesions include intimal tears, dissections (which are visualized as intraluminal linear or round filling defects surrounded by contrast material on both sides) (Figure 2), and pseudoaneurysms (which are seen as extravascular collections of contrast medium) (Figure 3). 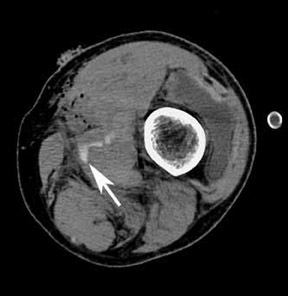 The CT signs of a pseudoaneurysm also include irregularity of the vessel wall and an abrupt change in caliber (Figure 4). Partial or total occlusions are visualized as a lack of opacification following the administration of contrast material. Arteriovenous fistulas (AVFs) are visualized by early filling of venous structure (Figure 5). These AVFs represent simultaneous injury of an adjacent artery and a vein. The main CTA finding of vessel transection is the presence of prompt contrast extravasation into surrounding structures (Figure 6). The presence of active extravasation of contrast must be recognized because it indicates a need for urgent surgery to prevent exsanguination. Most patients with vessel transection are hemodynamically unstable and require immediate surgical intervention; therefore, these lesions are rarely encountered on CTA examinations. Injuries to the neck are more frequently the consequence of penetrating trauma. The management of hemodynamically unstable patients who have suffered a penetrating neck injury is emergency surgical exploration. 8-12 On the contrary, the diagnostic evaluation of hemodynamically stable patients who present with wounds that penetrate the platysma muscle is still controversial. Most surgeons currently practice selective conservative management based on the use of multiple diagnostic studies including angiography. Recently, the use of invasive routine angiography in stable patients has been discouraged because of the high number of negative examinations 13-15 and the availability of alternative noninvasive diagnostic methods, such as helical or multislice CTA. 1,2,4,5-7 In some recent series, the sensitivity and specificity of CT angiography for diagnosis of cervical vascular injuries have been reported to be in the range of 90% to 100%. 1,4,5,7 CT angiography can also provide additional information about nonarterial injuries, such as those of the cervical spine and the aerodigestive tract. 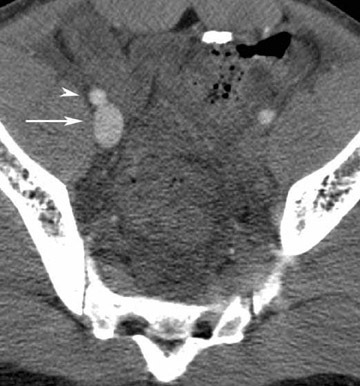 2,4,7 In gunshot wounds to the neck, CT can delineate the bullet trajectory and help identify potential injuries, thus reducing the need for additional studies such as endoscopy and/or contrast esophageal studies in patients whose trajectories are clearly away from the aerodigestive tract. Further studies are needed to more precisely define the possible role of CT for the evaluation of the aerodigestive tract injuries. Blunt traumatic injuries of the extracranial carotid and vertebral arteries have been regarded as uncommon injuries with potentially devastating consequences. Recent literature suggests that the true incidence of blunt cerebrovascular injury is higher than was initially described. 16 Centers performing an aggressive screening of selected patients using angiography have reported a higher incidence of 0.33 to 2.7%. 16-21 Although noninvasive techniques, such as multislice CTA and magnetic resonance angiography (MRA), have potential as screening tools in patients with blunt cerebrovascular injury, angiography is still considered the study of choice. 19-22 Recently, CT of the carotid and vertebral arteries in all trauma patients who are scheduled to undergo CT of the cervical spine has been recommended by Mutze et al. 21 The use of CTA as a screening method for these blunt cerebrovascular injuries will require further investigation. Vascular injury that involves the lower extremities is a serious complication following both penetrating and blunt trauma. In order to reduce morbidity and mortality, prompt diagnosis and subsequent treatment of these injuries are critical. Clinical signs of arterial injury include "hard signs" (such as pulsatile bleeding, expanding hematoma, pulse deficits, distal ischemia, and thrill/bruit due to AVFs) and "soft signs" (such as proximity of the injury to a major artery, stable hematoma, hypotension, and neurological deficit). 6 A penetrating wound in proximity to vascular structures is considered an indication for angiography only in cases in which a bullet follows the course of a major artery over a long segment. 6 Traditionally, patients who remain hemodynamically stable following lower extremity injury undergo evaluation with direct contrast angiography. However, this technique has limitations, including its invasive nature as well as transporting and monitoring issues. Additionally, this invasive procedure may result in unnecessary risks to these patients, as nonsurgical diagnoses (such as nonocclusive intimal flaps, partial narrowing, and branch vessel occlusions) may be revealed. Multislice CTA provides a rapid, minimally invasive study to evaluate lower extremity arterial injury. In addition, CTA aids in diagnosing the location, extent, and type of vascular injury to the lower extremity. In many major trauma centers throughout the world, helical and multislice CTA is now being used for the evaluation of arterial injuries. The advantages of CTA include, among many others, the speed at which the examination can be completed and its minimally invasive nature. We believe that CTA might be warranted as an initial method of diagnosis in patients who are hemodynamically stable and who do not have an indication for immediate surgical exploration. CT angiography demonstrates the potential to discriminate between patients who require further invasive imaging/exploration and those who can be safely discharged home. Patients with direct signs of vascular injury on CT do not need further evaluation, and, at many centers, including our own, patients are taken to surgery without angiography. A minority of patients may still require digital subtraction angiography when CTA examinations are nondiagnostic or have equivocal or indirect findings. 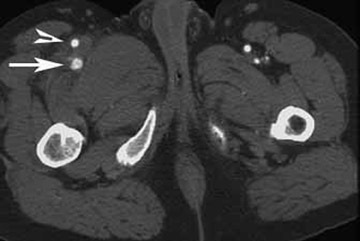 Multislice CT for vascular injuries. Appl Radiol.